The Maria Stein Shrine of the Holy Relics will host a collaborative project by photographers PJ McKey and Dennis Aubry from February through June 2019. MARIA STEIN – From February through June 2019, the Maria Stein Shrine will host a unique art exhibit from Via Lucis Photography. “Throne of Wisdom” is a collaborative project by photographers PJ McKey and Dennis Aubry. McKey is an artist, theater director and photographer. She has exhibited her photography and art in numerous juried shows, including Cotuit Center for the Arts and the Smith College Alumni exhibit in 2005 and 2010. Her photographs are explorations characterized by an artist’s sensitivity to light, shape and texture. Aubry has been a photographer for more than 20 years. He was founder and CEO of Altamira Group, the software company that created the Genuine Fractals software application, and spent many years developing software for scalable high-resolution digital imagery. His photographic work is characterized by his understanding of the technical accomplishments of the medieval builders and a desire to discover the spiritual underpinning of the structures. “Some of our favorite photographic subjects are the Throne of Wisdom Madonna’s, captivating and powerful iconographic images of the Romanesque era. Most of these are small, polychrome wooden statues from the 12th and 13th centuries. The Sedes Sapientiae (“Throne of Wisdom”) is an icon of the Mother of God in majesty and was found throughout Romanesque Europe,” Aubry said. When taken as a set, these Throne of Wisdom Madonna’s carry enormous symbolic power. 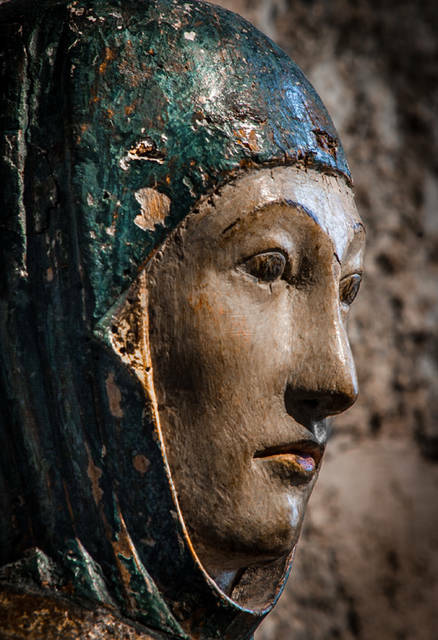 In the reborn and rejuvenated Romanesque world of France, these images symbolized the saving grace of the Church and the protective embrace of one they considered the mother of all. The exhibit, located on the Shrine’s third floor and in The Upper Room, is free and open to the public. To learn more about the exhibit or the Maria Stein Shrine, visit mariasteinshrine.org.